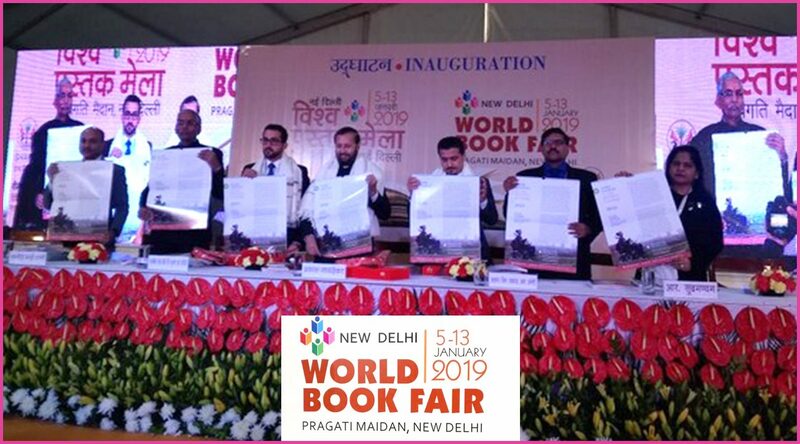 05 January 2019, New Delhi : Union Minister for Human Resource Development Prakash Javadekar inaugurated the 27th edition of the New Delhi World Book Fair 2019 at Pragati Maidan, New Delhi today. While speaking on the occasion Shri Javadekar said that Books and culture complement each other. Despite the growing digitalization, the demand for books has not decreased. The culture of reading in India is increasing day by day. This is the beauty of Indian culture, Shri Javadekar added. He further said that one’s life becomes prosper because of books and not because of money because since books are most precious of all. Welcoming Sharjah – the Guest of Honour this year at the Book Fair – Javadekar said that the ties between the two nations go back a long time. He said that Sharjah is home away from home for millions of Indians. The Union Minister gifted the book ‘Exam Warriors’ authored by the Prime Minister Narender Modi to H.E. Sheikh Fahim Bin Sultan Al Qasimi, Executive Chairman of the Department of Government Relations, and said that despite his busy schedule, the Hon’ble prime Minister is a regular reader of books. Praising the theme of the book fair ‘Books for Readers with Special Needs’ Javadekar also inaugurated the Theme Pavilion. With emphasis on the reading needs of Children, the Theme Pavilion is projected to carry forward the idea of Inclusive Learning, and explore various issues and dimensions of creating, producing and disseminating content for the readers. An exclusive exhibition of 500 books including Braille books, audio books, silent books, tactile books, integrated print-Braille books, books for differently-abled, children with sight or ear impairment, austistic kids, children/readers with ADHD, behavioural/psychological problems/anxieties is the major highlight of the Theme Pavilion. In addition, for the first time, an International Disability Film Festival is being organized at the New Delhi World Book Fair, where over 45 documentaries from 27 countries will be screened every day. Speaking on the occasion, H.E. Sheikh Fahim Bin Sultan Al Qasimi, Executive Chairman of the Department of Government Relations talked about the strong ties between the two nations which goes back to many centuries, and which is growing even stronger by the day. Mr Ahmad bin Rakkad Al Ameri, Chairman, Sharjah Book Authority was the Guest of Honour. J. L. Kaul, Padma Shri awardee and Secretary General, All India Confederation of the Blind; and Mr Habib Youseff Abdallah Al Sayegh, Authors’ representative from Sharjah were the special guests on the occasion.